Email marketing has never been so simple! Register Customers in your Clover Remotely! What is Customer Sign Up? Customer Sign Up allows you to enter customer information into your Clover like never before. With Customer Sign Up you can either pivot your Clover to have your customers enter their own information OR enter it in using any Android device! Building your customer contact list at the register with a busy store can be difficult and error prone, with the Customer Sign Up, customers can enter their OWN information while they wait in line, or after they have paid. 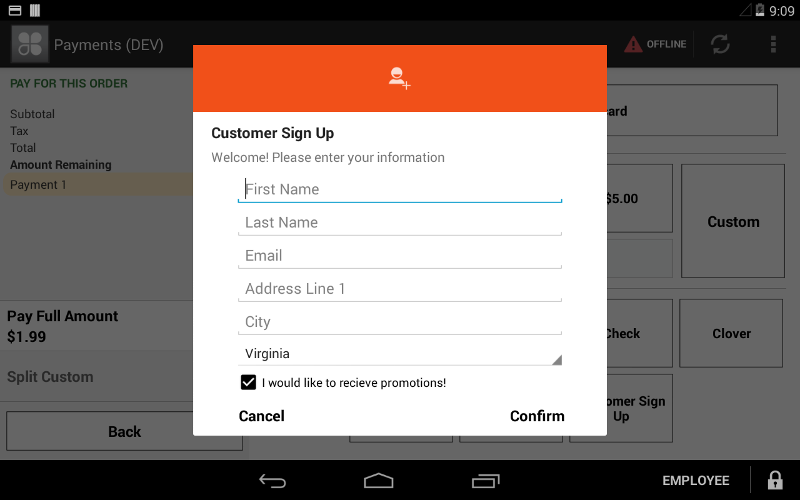 Pivot the screen and start Signing up customers! Which data fields can I collect from my customers? You can collect First Name, Last Name, Phone Number, Email Address, Street Address, City, State, Zip Code, and thier marketing prefernce. Can I customize which fields to collect? Yes! Simply open the app's settings to choose which fields you would like to collect. Do I need a tablet for this app? No. You can simply use your Clover and turn it towards your customers to have them enter their information. Do I need a particular tablet for the companion app? The companion app can be downloaded on any Android Device, however it works best on a tablet. If you need a tablet, we suggest either the Dragon Touch or the Galaxy Tab 4. The application on your Clover will display a password for you to enter into the Companion App. Do I need a password for every device? How long is the password valid for? The password is valid until another password is generated. How do I exit the Companion App? Press the back button 11 times, then select a launcher besides the Clover Customer Sign Up app.